Concrete Waste Receptacles | Petersen Manufacturing Co. Inc.
Petersen concrete waste receptacles are manufactured in Denison, Iowa, and have representation in every state, Canada, Puerto Rico, Hong Kong, and Mexico by authorized Petersen representatives. Concrete waste receptacles are available in various sizes, shapes, textures and colors. Logos may be cast-in-place or screenprinted on to receptacles, and add on snuffers are available. Who uses concrete Waste Receptacles? Petersen concrete waste receptacles are frequently purchased by local, state, and federal government agencies, fast food restaurants, malls, shopping centers, schools, airports, parks and recreation departments, residential complexes, and many others including customers purchasing individual waste receptacles to beautify their homes, patios, and gardens. Advantages of concrete Waste Receptacles? Petersen concrete waste receptacles offer maximum durability and minimum maintenance. The rugged steel reinforced construction of the concrete waste receptacles, makes them an ideal solution for outdoor use. Yet, the gentle beauty, enhanced by a variety of color and texture options, offers versatility that will add aesthetic value to property. Concrete Waste Receptacles are resistant to the effects of weather and maintain their appeal after years of use. Precast Concrete Trash Receptacles are less susceptible to vandalism and due to their weight they prohibit theft as well as incidental movement. 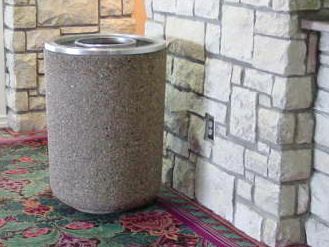 Concrete trash cans encourage proper waste disposal prior to entering a facility and in public areas. How soon will I have my Concrete Waste Receptacles be delivered? Petersen concrete waste receptacles come in a variety of sizes and designs, with a selection of color choices and textures for each. Petersen Mfg. Co. has multiple fiberglass and steel forms for all Petersen concrete trash containers and will do everything possible to meet your needs for delivery times. Petersen Mfg. Co. builds all their forms in-house and will customize or design waste receptacles to fit your needs. Once you decide on a Petersen concrete waste receptacle and how many you need, Petersen Mfg. Co. will give you an estimated time for quick delivery. Where can I view CAD Drawings for Concrete Waste Receptacles?